Brady's sire is the stunning, stallion of a dog, Am/Can. MBIS Ch. Summer's Dash Riprock SOM (Dash), who was sadly taken from the Boxer world much too soon. I am very proud to be able to say that Brady and his five littermates are a result from Dash's last naturally sired Canadian litter. I want to thank Josie and Tom O'Reilly of Summer Boxers (Reg'd) for allowing me to breed my Ally McBeal to Dash Riprock. The future looks very promising for Brady and his littermates. Brady finished his Canadian Championship in just six days of showing (two weekends). He was shown by Lori-Ann Fischer to his first 5 points at the Saskatoon Kennel & Obedience Club shows September 4 to 6, 2004. The following weekend, at the Edmonton Kennel Club shows September 10 to 12, 2004, Brady picked up 7 more points to complete his Canadian Championship! Brady was handled through the classes and Winners by his sire's breeder and owner, Josie O'Reilly of Summer Boxers and handled by myself (Cindy) as well as handled by Nancy White of Tashawne Boxers to his Best Of Winners wins! Brady is the 2nd Canadian Champion for his dam, Can. Ch. CynTech's Ally McBeal DOM (Allie), and the 9th Canadian Champion for his sire, Am/Can. MBIS Ch. Summer's Dash Riprock SOM (Dash)! In 2005, Brady and his litter sister Can. Ch. CynTech's DashNBy Tornado Ally (Bindy) won a total of 3 Best Brace In Breed, 3 Best Brace In Group, and 2 Best Brace In Specialty Shows. They were breeder/owner handled to all these wins! 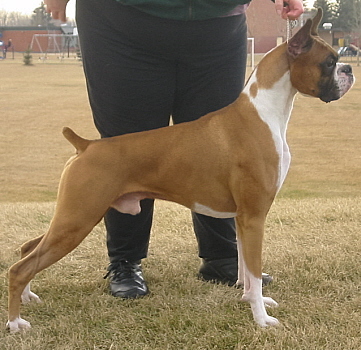 Brady also made the cut, breeder/owner handled, in a very nice entry of specials under Boxer breeder judge Warren Hood at the Alberta Boxer Club Specialty on April 23, 2005! Brady earned his Canine Good Neighbour (CGN) title January 29, 2006, under evaluator Kathy Albrecht breeder/owner handled! Click here to see Brady in action at the CGN test! In 2006, Brady and his litter sister Can. Ch. CynTech's DashNBy Tornado Ally (Bindy) won a total of 2 Best Brace In Breed, 1 Best Brace In Group, and 1 Best Brace In Specialty Show. They were breeder/owner handled to all these wins! 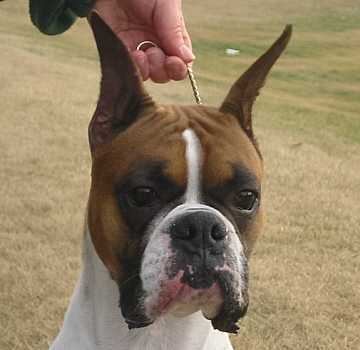 Brady also made the cut, breeder/owner handled, in a very nice entry of specials under judge Lester Mapes at the Alberta Boxer Club Specialty on August 6, 2006! Brady completes all the requirements for a Temperament Test held at the Alberta Kennel Club show in Calgary, Alberta and sponsored by the Belgium Shepherd Dog Club of Canada on August 6, 2007! Flash! Brady is now the proud sire of his first Canadian Champion when his son, now known as Can. Ch. CynTech's Smooth Criminal (Rocky), won Winners Male, Best Of Winners for a 3 point win to finish as well as Best Puppy In Breed under judge Houston Clark (USA) at the Battle River Canine Association show on March 27, 2011! Keep checking back for updates on Brady.